Lisfranc or tarsometatarsal joint complex injuries are rare and often missed or misdiagnosed. Delayed diagnosis of Lisfranc injuries may result in significant long-term morbidity. The most common mechanism of Lisfranc injury is forceful axial loading of the plantarflexed foot. The tarsometatarsal joint complex provides significant structural support for the transverse arch of the midfoot. Dorsal, interosseous, and plantar ligaments, collectively known as the “Lisfranc ligament,” stabilize the articulation between the medial cuneiform and the second metatarsal base. However, Lisfranc injuries may involve any of the tarsometatarsal joints within the complex. Tarsometatarsal joint complex injuries may be associated with articular cartilage damage sustained at the time of injury and often pose a high risk for post-traumatic osteoarthritis and chronic pain. 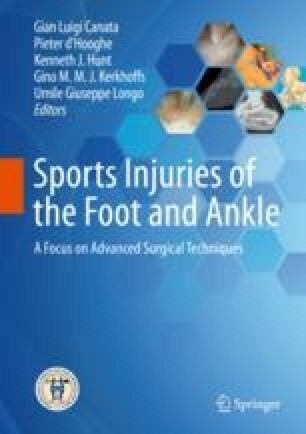 Management of Lisfranc injuries is tailored to the acuity, pattern, and severity of the injury within the context of patient-specific demographic factors. Non-operative management is typically recommended for stable injuries, while unstable injuries are often treated via surgical intervention. Surgical stabilization of the Lisfranc joint is most commonly achieved with either open reduction and internal fixation or primary arthrodesis of the associated joints. Anatomic reduction of the tarsometatarsal joint complex is a key factor in determining positive outcomes following injury; and as such, operative management for Lisfranc injuries has proven to be a superior treatment option when compared to non-operative management. Jeffreys TE. Lisfranc’s fracture-dislocation: a clinical and experimental study of tarso-metatarsal dislocations and fracture-dislocations. J Bone Jt Surg 1963;45B(3):546–551. https://online.boneandjoint.org.uk/doi/pdf/10.1302/0301-620x.45b3.546. Accessed 26 Sept 2018. Hardcastle PH, Reschauer R, Kutscha-Lissberg E, Schoffmann W. Injuries to the tarsometatarsal joint. J Bone Jt Surg. 1982;64-B(3):349–356. https://online.boneandjoint.org.uk/doi/pdf/10.1302/0301-620x.64b3.7096403. Accessed 1 Oct 2018. Perez Blanco R. Tarsometatarsal fractures and dislocations. J Orthop Trauma 1988;2(3):188–194. https://ovidsp.tx.ovid.com/sp-3.31.1b/ovidweb.cgi?WebLinkFrameset=1&S=EMEFFPHINKDDNEHHNCEKOBIBJHADAA00&returnUrl=ovidweb.cgi%3FMain%2BSearch%2BPage%3D1%26S%3DEMEFFPHINKDDNEHHNCEKOBIBJHADAA00&directlink=https%3A%2F%2Fovidsp.tx.ovid.com%2Fovftpdfs%2FFPDDNCI. Accessed 1 Oct 2018. Ouzounian TJ, Shereff MJ, Sherman Oaks Md, York N. In vitro determination of midfoot motion. Foot Ankle Int 1989;10(3):140–146. http://citeseerx.ist.psu.edu/viewdoc/download?doi=10.1.1.876.7651&rep=rep1&type=pdf. Accessed 1 Oct 2018.